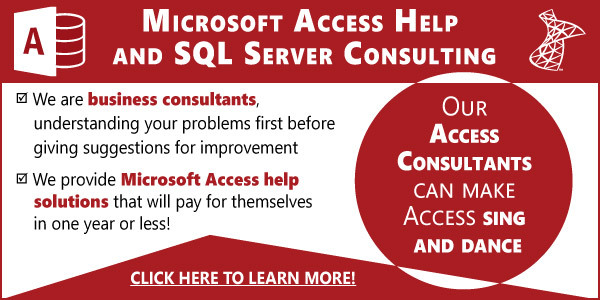 Our Access/SQL Server/SharePoint practice benefits from great tools on the web, some free and some not, and I’d like to share our experiences with you. We usually use the Remote Desktop Connection when working with our client’s systems, but sometimes that’s not an option, so we ask them to install LogMeIn.com, which is free. The product has gotten better over the years and now offers support for multiple monitors, local printing and shared clipboards among other features. They offer a subscription product called LogMeIn Ignition for Windows, which allows us to easily login to all of our client computers without having to go to LogMeIn.com, definitively worth the price if you plan on supporting many people this way. I can’t tell you how many times I’ve had to pull over and help a client using my iPhone or iPad using the LogMeIn app. It’s not cheap at $29.99 compared to other $0.99 apps, but when you support clients for a living it’s indispensable. Buy it once and use it on all your IOS devices. Our favorite support tool is now Join.me, it’s free and it’s also from LogMeIn.com but unlike LogMeIn it does not install a program for the viewer and it’s a small executable for the presenter. It’s what we use for all of our web conferences and has a free iOS app to boot. One big plus: It works even if both the presenter and the observer are both using Remote Desktop Connections, something we can’t say for other support tools out there. I’ve used the iOS app over 3G with the VOIP feature to speak with the client and it ran with no issue, you owe yourself to check this one out. We make our living with hourly consulting so it’s imperative we keep track of our time and it doesn’t get any easier with the free Toggl.com We keep track by project and client and best of all it keeps going even if we get the blue screen of death. We used to share large files using FTP, which was not intuitive for our customers. No more! Now we use DropBox for sharing files with clients and among ourselves, it doesn’t get any easier or more powerful than this. We can share a single folder with a client and anything we place in there gets automatically synced with them. We sprung for the $9.99 monthly plan since we also use it to share our code and store our server backups. We will most likely get the team package for $799 and get 1,000 GB of space, which we will use to backup our SQL Server databases over the web. If you’re still backing up with tapes or backing up to a local drive you’re asking for trouble. How are you going to recover if there’s a fire, robbery or equipment failure? Backups over the web are the only way to go for piece of mind. I use the cheaper Mozy.com for my home PC and MozyPro.com for our servers. Space is dirt cheap at $0.50 per GB per month. We have run our business on Quickbooks since 1994, but I got tired of the constant upgrade cycle, when Intuit introduced an online version we sprung at the chance to take our accounting to the next level. We signed up for the payroll service at Costco, (more on that below), and get further discounts through our accountant, (if they are not signed up get them to do so for the great discount). You may also get by with the minimum three logins, since your Accountant is free and so are any employees/consultants who are only entering their billing time. They use Toggl to track time and enter the entries into QB Online. By far one of our best investments has been the Costco business membership. We get our business checks, payroll processing and a big fat check once a year from them since we buy as much as we can there. We LOVE WordPress and will be switching all of our web properties over to this great technology. The extensions, easy to use software and powerful features make it a no-brainer for us. I’ll be blogging about our setup in a future post, but if you are considering this for your firm we do offer hosting for WordPress at only $125/year. Contact us for more details. ” Hi Juan, great post. I usually spend hours on the web reading posts on productive business tool. The business tools you listed both free and paid are awesome. Dropbox is one of my several favorites. I would also recommend a business tool named TALYGEN. Details can be viewed at http://www.talygen.com. I agree that LogMeIn is pretty good – I use the iOS LogMeIn Ignition all the time for when someone will ask me to have a quick look at something when I’m out and about, although I find the connection drops out more often than I’d like. I’m interested in why you say you use Remote Desktop by preference to LogMeIn? On the subject of offline storage, here in the UK we have an option called LiveDrive, which is provided by Tech Guys (essentially a branch of the PC World stores). I pay around GBP70 per year, and get unlimited storage offline, which maps to my L: drive, making it easy to use. You can specify that you want access to the files offline, in which case they’re stored in a cache on the hard drive. Every change is automatically detected and uploaded to the cloud, and then down to any other machines with which you’ve subscribed (there’s no charge for additional machines). You can also access the files via any (non-subscribed) PC via a web interface, and it costs nothing to subscribe multiple PCs. Not a big fan of PC World, but this is a service I’d be lost without. I prefer RDC over LogMeIn since RDC will compress two monitors into one, I don’t need a browser and other benefits over LogMeIn. I’ll take a look at toggl, but as an FYI, I’m using HoursTracker for the iPhone and it is very good. it has a very clean interface for entering your information and it also has a very useful export function which allows the user to really leverage the captured info. Some great recommendations. I had heard of many of these products, but JoinMe was brand new to me. I’ve used logmein free for years, but never noticed Joinme. Toggl is also a nice free tool. As far as remote support software you should also checkout Teamviewer. You can use it free extensively before you purchase. It is a little pricey, but once you buy it you own it for life, and you can support an unlimited number of clients. Keep the articles coming.